Balkan Floods Expose Deadly Mines From 1990s Civil War : The Two-Way The Bosnia and Herzegovina Mine Action Center says a decade of work to reduce the danger from land mines has been washed away by the rising waters. A map showing a land mine field is seen in the water during heavy floods in the village of Prud, Bosnia and Herzegovina, on Tuesday. 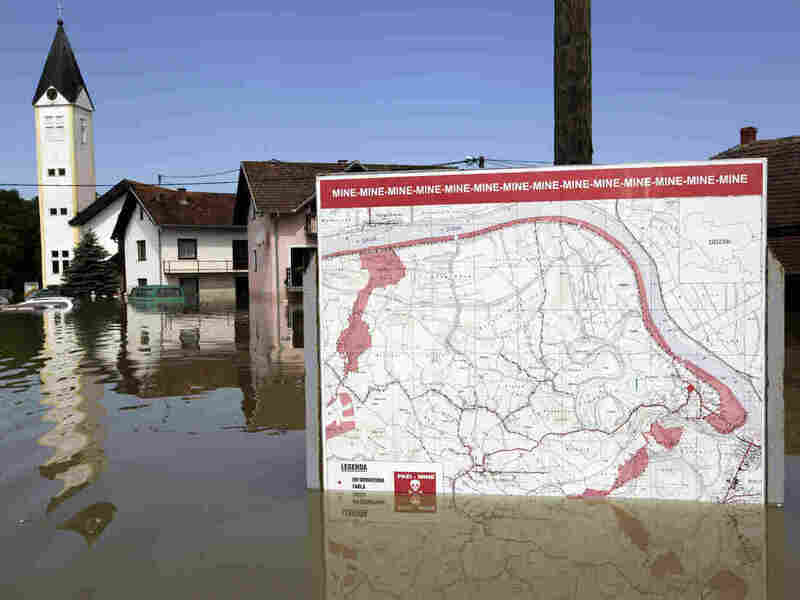 Bosnia and Serbia are struggling to recover from the worst flooding in a century, after three months of rain fell in just three days in the Balkan countries. At least 40 people have died in Bosnia, Serbia and Croatia. Half a million people have fled their homes, and tens of thousands are without drinking water. Bosnian Foreign Minister Zlatko Lagumdzija compared the physical destruction to the country's 1992-'95 civil war. Hundreds of landslides have swept away homes. Rescue workers from the European Union, Russia and Turkey have been helping stranded people and delivering food, blankets, generators and clean water to those in shelters. There have also been reports of thousands of dead animals — cows, sheep, pigs and dogs — washing up as floodwaters have receded. But the Bosnia and Herzegovina Mine Action Center has been working around the clock on another emergency: dislodged land mines. About 2 million land mines were planted during Bosnia's civil war. The mine action center helped remove most of them. Only 120,000 remained in a 460-square-mile area, marked by some 25,000 signs. "We spent 10 years marking this area with warning signs," Ahdin Orahovac, the center's deputy director, tells NPR. "In these few days, everything is gone." Land mines have killed about 1,800 Bosnians since the end of the war, so people are aware of the danger, Orahovac says. Several people in flood-affected areas have already called to report discovering several bombs, grenades and other unexploded ordnance, he says. "Our message to everyone that calls is: Don't touch these things. Wait for us or rescue workers to come," he says. "So I hope this works, and there will not be accidents." His team is also mapping each report of a found land mine. "This is a slow and expensive process, but we don't have time," he says. "It's complicated. We are going to need special teams and money. We are going to need help from outside." There are also fears that waters and mudslides have pushed some land mines into neighboring countries. The mine action center is working with Republika Srpska (the Bosnian Serb republic) as well as Serbia and Croatia to deal with land mines that rivers have likely swept past borders. "It's a regional problem now," Orahovac says.